I’d heard about TED Talks, but I had never actually watched one. Then I ran across a fellow named Simon Sinek who gave a talk on how great leaders inspire us. What he said has a direct bearing on authors. It caused me to re-craft my author message — the short, pithy communication that tells people what I do and why. Simon’s core idea is that great leaders communicate in precisely the opposite fashion as the rest of us. He illustrates this with a concept he calls the ‘Golden Circle’. Everyone working within an organization can tell you what the organization does. Some of those people can tell you how the organization does what it does. Very, very few people can describe why their organization does what it does. 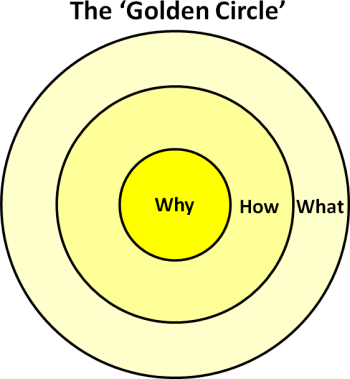 Most people communicate from the outside of the golden circle inwards. Inspiring leaders communicate in exactly the opposite fashion – from the inside out. He goes on to further make the point that people buy why you do something, not what you do. So, what does this have to do with authors? My guess is that most authors communicate from the outside in. As authors we must communicate from the inside out, and be very clear on the ‘why’. In short, authors must be inspiring leaders. I write fantasy novels involving strong women. ‘Western Watch’ is about a flawed heroine fighting for her life in a fantasy world of steel, leather, and horse. It’s 120,000 words of fast-paced action, brutal situations, sly schemes, and believable characters. Want to buy it? The message communicates what I do, and a little bit about how I do it. There is nothing at all about why I do what I do. I believe people must be able to temporarily escape from their lives to rest, relax, and recharge themselves mentally in order better meet the challenges life presents. I help them escape using the tools under my command – the written word, images, and sound – to craft compelling stories that draw a person away from their daily cares and into worlds they would never otherwise visit. One of those stories happens to be about a flawed heroine with few friends and many enemies fighting for her life in a world of steel, leather, and horse. Would you like to read about her? I like this one much better. It moves from the inside of the golden circle to the outside. The message establishes why I do what I do very clearly. Moreover, while it implies that I write, it also leaves open the possibility that I provide stories in animated, graphic novel, or other formats. I will likely tweak this message a bit to refine the wording, but on the whole, it is much better than typical ‘outside-in’ communication. I think that all authors should spend time to craft an ‘inside-out’ message. It will get more traction than “Buy my book, it’s great”.